Our range of multiple Drink Dispensing Counter is specially designed for drinking water dispenser. 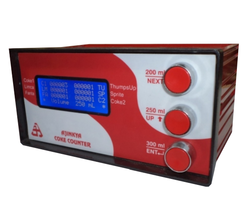 Its unmatched features have made it different for from all other regular dispensing counters. Six digits counter each for six drinks and three volumes. We also manufacture World Time Clock. These clocks are also known as, digital world clock, real-world clock, modern world clock, global clock, office clock, timepiece, time zone clock, world clock, world time, desktop clock, digital timer, digital clock, etc. This world time clock features a list of some of the largest, more well-known, and most visited cities in the world. Here, you can view time-zone information and a current time of a select group of cities. World time displays current local time in any place around the world. World time clock is an indispensable utility for everyone who deals with people abroad or anybody who is keen on knowing what time it is further than locally. These world time clocks are specially designed for businesses which are located in different time zones and want to know current local time of their partners and customers. Globally presence customer worldwide, and looks more attractive & eye-catching clock then older designed clocks. Looking for Consumer Electronic Products ?